We are volunteer-led. All our services are free. How did Ready Steady Mums begin? The RSM concept, and our first local groups, were set up by new mum Katy Tuncer in 2010. She began walking with fellow mums together in the fresh air a few weeks after her first son was born, and quickly the group realised the power of community support and the positive effects of actively embracing motherhood together. The idea spread, and new Group Leaders worked together, supporting each other, to build what is now the Socialcise programme. Katy and the Group Leader community consulted with medical and fitness experts, and built the exercise programme content now available on our site, and the groups grew – in number, size, and level of activity. One thing the community noticed was the vital role Health Visitors were playing for many of the mums taking part, so it seemed natural for the IHV to take the lead in empowering Group Leaders and RSM participants. The rest is history! What does Ready Steady Mums do? 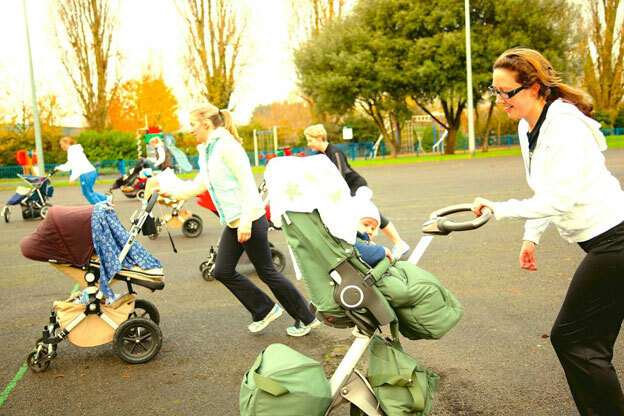 At the heart of Ready Steady Mums we have our community walking groups. Setting one up is easy, and Group Leaders claim it’s one of the best ways to make friends and build your self-confidence as a new mum. Our simple exercise programmes provide video demos and advice on safe exercises in pregnancy and beyond. Our approach is medically-based and designed by experts in fitness and healthcare. Over five years we have worked with dedicated and talented people to build Ready Steady Mums to support community leadership and safe physical activity for mothers. We have observed the outstanding impact on both physical health and emotional wellbeing for thousands of mothers around the UK, and we’ve only just begun. We have made it our mission to know everything there is to know about pre and postnatal exercise. We have researched the literature, consulted extensively with medical and fitness experts, collaborated with institutions and organisations at the cutting edge of this field. We have worked directly with thousands of mothers – during pregnancy, recovery from birth and on the journey to full fitness. If you want to set up your own Socialcise group find out more about becoming a Socialcise group leader. We’re with you all the way and I’m looking forward to working with you.